Fullerphone Mk. 6 (right) was a fully tropicalised version, enclosed in an immersion proof metal case. The Fullerphone itself was almost similar to the Mk. V. Note the use of Headphones type DLR No. 5. 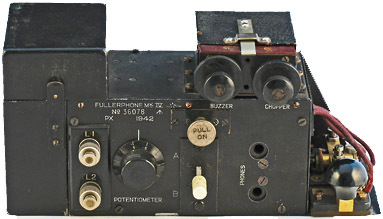 Fullerphone Mk.IV* (right) was a slightly modified Mk.IV incorporating radio filtering to reduce interference and the possibility of radio interception. 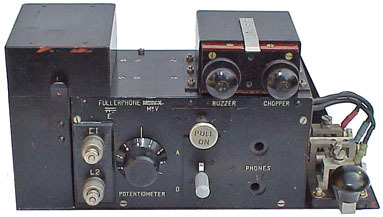 The Fullerphone Mk.IV** (not shown here) was similar to Mk.IV* but fitted with a crash limiter. 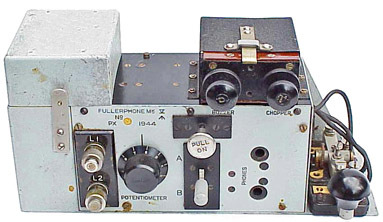 Fullerphone Mk.IV* (right) produced by Northern Electric Co. in Canada. Earlier production instruments had a Canadian Key W.T. 8 Amp No. C2. Later manufactured Canadian Fullerphones were fitted with Canadian Key W.T. 8 Amp No. C3 (as shown in the drawing right). Fullerphone Mk. IV * modified to Mk. V (right). The key in this photo was an early Key W.T. 8 Amp No. 2. Fullerphone Mk.IV, Mk.IV*, Mk.IV**, Mk.V and Mk.6. In 1935 the “Fullerphone Experimental” was developed, based on the Fullerphone Mk.III. It was much lighter, smaller and had a modified and replaceable buzzer. The telephone facility, which was incorporated in the Mk.III was omitted as being liable to be used in a forward area by a non-technical user, under the impression that the speech from it could not be picked up by the enemy. This experimental model evolved into the Fullerphone Mk.IV. 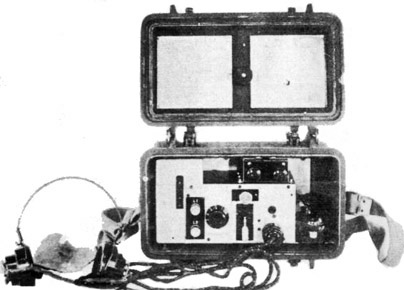 The most commonly used Fullerphones Mk.IV, Mk.IV* and Mk.V were housed in an aluminium and steel case, secured by guides in a wooden carrying case provided with a sling. The headphones were carried in the lid of the case (Mk.I case only) or in the Fullerphone case (Mk.II case). When the lid was completely closed, the ‘Pull-On’ switch was automatically set in the ‘Off’ position. A spring stop which kept the Fullerphone unit in position in the carrying case had to be pressed down for the unit to be drawn forward into the operating position. A second stop prevented the unit from sliding completely out of the case. The removable Buzzer F slide into position on the top right-hand side of the instrument, the connections being made by three contact springs. The Mk.IV* was fitted with radio interference suppression and to reduce the possibility of radio interception. A crash limiter was fitted in the Mk.IV**. Mk.V models were similar to the Mk.IV** but had a tropical finish. 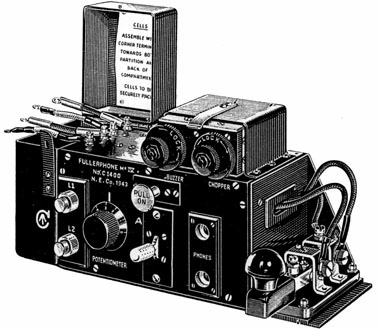 The Morse key was a Key WT 8 Amp No. 2 which could be one of the many versions which were produced over the time. The Morse key of the Mk.V and Mk.6, however, was a Key Signalling No. 2, tropicalised, which was similar in appearance to Key W.T. 8 Amp No. 2 Mk.II. It had contacts not made from the usual Tungsten but from different material which was more suitable for tropical use. These contacts could, however, not handle 8 Amperes, hence the different name and YA class VAOS stores number. Apparently all Mk. IV, Mk.IV* and Mk. IV** models were enamelled black . The later issued Mk. V and Mk. 6 models were usually light-blue/grey. In 1942 and 1943 Canada produced 14.000 Mk.IV and Mk.IV* Fullerphones. The instrument differed only in detail to the British parent model and was functionally and physically similar. The Morse key fitted in the later produced Canadian Fullerphones was a Canadian Key W.T. 8 Amp No. C3 which was a simplified version with two U-shaped bridges of pressed steel construction. Receivers, headgear, CLR, double No.3 and Receivers, headgear, DLR, double No. 5 (used with Mk.II case). Fullerphone Mk. V (right) was issued from mid World War 2 onwards and a tropicalised version of the Fullerphone Mk.IV**. The principle circuit changes were the use of Buzzer F Mk.II** which had the coils wired in parallel and Key, Signalling, No. 2, tropicalised.